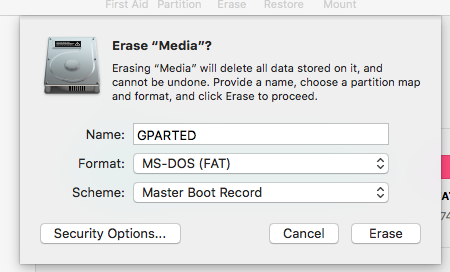 How to make and use an USB stick with GParted that will boot on a Mac? I want to create a USB stick with GParted on it that will be recognized by my Mac. Obviously, I want to create it on a Mac, also. This is not mentioned in the documentation here. I will answer my own question. Since I had a lot of trouble creating Live USBs on Ubuntu and Mac and wanted to dig a bit deeper into the subject and will also list the output of the successful partition schemes. Download .iso from here under "stable releases". If unsure, chose the 32bit-Version. Put a USB stick in the slot and look into Disk Utility for its device number (disk1, disk2, diskX, etc). This can be found by clicking the icon "Info". Make sure you don't dd to a wrong disk, e.g. your working HDD! We use the r for raw in of=/dev/rdiskX to make the copy faster. You should not be using the s1 extensions: these are partitions on the disk, not the disk itself. OS X will show a dialog to Initialise..., Ignore or Unmount the USB stick when it is put into the slot. Clicking Ignore is safe. I put the German screenshot in, I think it's pretty clear. When booting the Mac now press alt and there should be an option to boot to that is called EFI boot. This will bring up GParted Live. But beware, there are some Macs (e.g. Macbook Pro 17" Early 2011 that are not able at all to boot anything other from USB than OS X). Note: This answer does not require any third party tools or the use of the Terminal application. Note: The operating system used to create the bootable flash drive was macOS High Sierra Version 10.13.6. Download the latest gparted-live-*-amd64.zip file. Replace * with the current version. For example, if the latest version is 0.33.0-2, then you what the gparted-live-0.33.0-2-amd64.zip file. I assume this file will download to your Downloads folder. After the download completes, the zip file will be automatically convert to a folder. I my case, this folder was named gparted-live-0. Use the Disk Utility application to erase a 500 MB or larger flash drive. Select the options shown below. Using the Finder application, open the folder named gparted-live-0. The contents are shown below. Use the Finder application to copy the contents to the flash drive. Note: This was tested using an iMac (21.5 inch, Late 2013) with the latest firmware updates installed. Insert the flash drive in a USB port on the Mac. Restart the Mac and immediately hold down the option key. When the Startup Manager icons appears, choose the external drive icon labeled EFI Boot. When prompted, I choose the default startup option. If you read this reference, you will realize the advantages of using macOS instead of Linux. Not the answer you're looking for? Browse other questions tagged usb boot . How do I make my 1.5 GHz PowerBook G4 boot from a USB stick? How to make a small storage in my macbook to act as a USB stick? Didn't Apple use to provide USB stick with OS X on it? Is this error message a serious problem or can it be ignored (Unetbootin, Gparted, USB, menu.c32)?